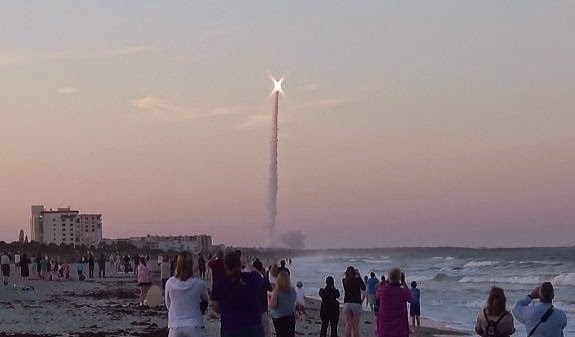 Spectators in Cocoa Beach, Florida watch a Delta IV rocket launch from Cape Canaveral. Brevard Times photo. CAPE CANAVERAL, Florida – The global space economy grew 4 percent year-over-year to $314.17 billion in commercial revenue and government budgets in 2013, according to The Space Report 2014: The Authoritative Guide to Global Space Activity, which was released by the Space Foundation this week. The overall growth was due mostly to a 7% increase in commercial space products and services revenue. Government spending on space decreased by 1.7% in 2013. Substantial space budget cuts in the United States outweighed gains in Canada, India, Russia, South Korea and the United Kingdom, all of which increased budgets by 25% or more. After two years of conducting fewer launches than China, the United States rose again to second place, partly due to an increased operational tempo as U.S. commercial providers launched cargo resupply missions to the International Space Station. 81 launch attempts took place in 2013, up 4 percent from 2012. The majority of these launches were conducted by Russia (32 launches), the United States (19), China (15), and Europe (7). New launch vehicles made their first flights (or first successful flights) in five countries—the Antares and Minotaur V in the United States, Soyuz 2.1v in Russia, Kuaizhou in China, Epsilon in Japan and KSLV-1 (also called Naro-1) in Korea. According to U.S. Bureau of Labor Statistics (BLS) data, the size of the U.S. space workforce declined for the sixth year in a row, dropping 3.5%, from 242,724 in 2011 to 234,173 in 2012 (the most recent full year for which data is available) - a decrease of about 8,500 workers. However, the changes varied by sector, with some portions of the space industry growing while others contracted. NASA's civil servant workforce remained essentially flat, declining by less than 1% to reach 18,068 in FY 2014. Although the workforce continues to become more concentrated at higher ages, NASA has experienced moderate success in recruiting and retaining young workers below the age of 35 during the past five years. Both Europe and Japan saw increases in space workforces; the European industry workforce grew by 1.5 percent in 2012, adding approximately 500 employees; in Japan, the overall workforce grew by 11 percent, while employment at the Japan Aerospace Exploration Agency (JAXA), Japan’s government space agency, dropped.